WolfPack hockey players, un­able to play hockey at TRU, have formed a beer league team. The team, called the Red Army, has 18 players, 11 of which used to play with the WolfPack or were newly recruited players who in­tended to play at TRU. The announcement that the WolfPack hockey team would not run for the 2014-15 season due to a funding shortfall came abruptly in July. This announcement left players in a tough spot, unable to play hockey and almost no time to transfer schools. With no other options, Cam­eron Weir and Alex Martin, now ex-WolfPack players, wrote up a roster and contacted the Molson IceBox Hockey League. “It really was easy to get ev­eryone back. Everyone wanted to play hockey, everyone came here to play hockey, so it was pretty easy to convince them to come play and pay a fraction of what we’ve had to pay for college hockey,” Weir said. The Red Army paid a team fee of $7,550 to compete in the league. If WolfPack hockey had gone for­ward, players would have been paying $2,400 each to play. 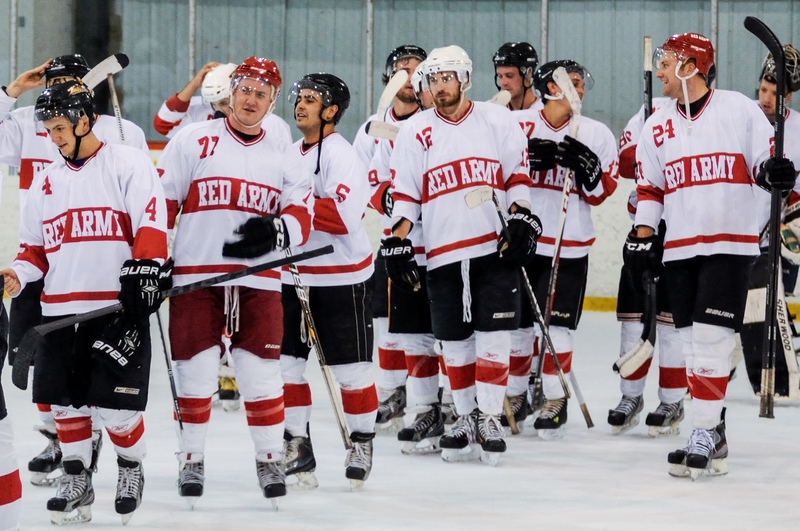 The Red Army, clad in jerseys provided by a local sponsor, played their first game on Sept. 30 against The Panthers in the Ice Box Are­na. The Red Army took the game by a score of 7-2. WolfPack refugees were happy to be back on the ice, but the sting of losing their spots on the univer­sity team is still with them. “I thought that it was pretty unfair to pretty much the whole team. I mean, they were all gear­ing up and training hard for a new season and all of the sudden, a month before school starts, ba­sically it’s all ‘hey you don’t have a team anymore,’” said Ben Bula, who played two years of defence with the WolfPack, and is now with the Red Army. “There were five or six of them, maybe a bit more, that actually came to TRU to play hockey. So now they’re just going to school and their hockey career could po­tentially be over, which is brutal,” Bula added. Desmond Bast also made the switch. He was one of the players that came to TRU just to play on the WolfPack. Bast found out on July 17 that he’d play for the ‘Pack. Twelve days later, hockey opera­tions shut down. “I had already arranged housing and schooling and everything. I just was at work and I got the text that there wasn’t going to be a team anymore and I decided education was kind of important to me,” Bast said. “It’s a little frustrating com­ing here for hockey. I’m busy with school at least,” Bast said. To solve the funding issue, the board of directors had originally considered increasing the hock­ey fees from $1,500 to $2,400 for players, rather than shutting down. “I would have paid for it. I would have taken a loan out from my par­ents and taken care of it I guess. I wanted to play hockey this year for sure,” Bast said. Weir, who played defence with the WolfPack, helped put the team together. “We wanted to get the boys back together. That’s why we came to TRU to play hockey, the camara­derie just as much as the hockey itself. I originally came here for the hockey program. I had a few schools to look at for hockey and that’s why I ended up here. “You work so hard every day of your life in the gym, on the ice, you get to the point where you are and just to have it taken away by a text message,” Weir said. Weir said he also would have paid the fee increase. Out of the whole team, Weir said only one player made it to another school to play hockey this season. “We had one guy who went somewhere else. Just one of the whole entire team who is still play­ing hockey,” Weir said.